From top left to bottom right: Isle of Mull Cheddar, Grimbister, Blarliath, Lanark Blue, Criffel, Strathdon Blue, Dunsyre blue, Anster, Clava and Connage Crowdie. Scotland has a small but talented band of cheesemakers, and it also has a significant champion in cheesemonger Iain Mellis. 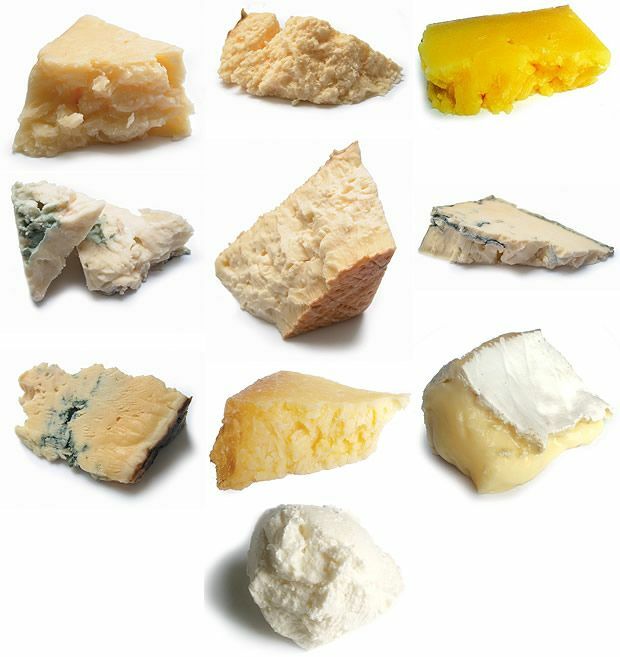 Here Iain and his colleagues Benjamin Newell and Alistair Marr select their top ten cheeses. Isle of Mull Cheddar is considered by many as the daddy of Scottish cheddars. Strong, fruity and brooding, Isle of Mull cheddar is made from unpasteurised cow’s milk on Sgriob-ruadh (pronounced ‘Ski-brooah’) farm on the tranquil Isle of Mull in the Inner Hebrides by Chris and Jeff Reade and their sons. What stands out about Isle of Mull in relation to other cheddars in the British Isles is its colour. Whereas most cheddars are insipid or rich in yellows, Mull is more ivory in colour. Herein lies its instant attraction. This ivory veneer gives off a sense of what the palate may expect. There is no doubting that Mull is a complex cheese that evokes a plethora of tastes. It’s deep and strong, ballsy in its outlook and at times can be quite severe on the palate, but it is rewarding when fully devoured. The prominent overtones of grass and fruit are due to Sgriob-ruadh’s cows having their feed supplemented by leftover fermented grain supplied by the nearby Tobermory malt whisky distillery. Grimbister Farm Cheese is a family-run business producing traditional Orkney farmhouse cheese made to an age-old recipe handed down through the generations. Made from unpasteurised cows’ milk, Grimbister is a gentle soul of a cheese with a mild and fruity taste. In Orkney it is eaten at a very young age in its maturity (around six weeks) and offers a smooth and silky taste while retaining a subtle zestiness. Here at Iain Mellis Cheesemongers we tend to mature Grimbister to around 10–12 weeks, therefore offering a different blend of taste and texture. In this case Grimbister becomes more crumbly in texture and offers a deeper lemony taste. It blends wonderfully with grapes (or any fruit for that matter) and it’s certainly one to drink with a nice Pinot Grigio or for that matter a can of frosty beer. If Isle of Mull cheddar is the elder statesmen of Scottish cheddars, then Blarliath is the Young Pretender to the throne. Conceived by Ruaraidh Stone at Highland Fine Cheeses near Tain, this cheddar is a ‘tongue sucker’ of an experience, evoking the farm yard environment it comes from. Blarliath is without doubt mild cheddar, but it has many layers of taste and texture. It has a rubbery and murky yellow exterior. Once placed within your mouth you feel as if it may melt instantly but then offers up a lottery of tastes. Perhaps that’s the defining character of Blarliath: its unexpectedness. Gentle on the palate but with an exquisite aftertaste you yearn for more and it seems to demand repeated tasting. A dark horse, but a worthy one. First produced by Humphrey Errington in 1985 at Walston Braehead in Lanarkshire, Lanark Blue was the first British blue sheep’s cheese for centuries, and most likely the first ewe’s milk cheese made commercially in Scotland in the 20th century. With its mild ewe’s milk tang and graceful blue veining, Lanark Blue is certainly one for eating on its own, but would also work wonderfully wedged in between two hefty slices of soft brown bread accompanied with a full bodied red wine. Very much in the style and flavour of Roquefort, Lanark Blue changes from season to season due to twice yearly lambing. Early season cheese has an enduring, persistent sweet flavour with a prickly undercurrent; late season cheese is rigorous and more savoury. Made at the Dumfries-based Loch Arthur Creamery, Criffel is a strong semi-soft cheese that attacks the palate with the subtleness of a hammer and leaves you craving more of its dense and grassy-rich flavours. Undoubtedly pungent, it flares the nostrils and its stays with you long after the initial tasting. The farm, dairy and creamery at Loch Arthur are run to strict biodynamic principles, helping to produce a cheese completely in tune with its environment, the flavour of the land in every mouthful. If Ruaraidh Stone’s Strathdon Blue were a film it would be classed as avant-garde. This is an inventive, original, devastatingly tasty and vibrant cheese capable of bringing out all the emotions in great cheese lovers. Though essentially mild, it has a wide range of flavours, tastes and textures. It leaves you tingly and numbs the mind with its delightful salty aftertaste. Also, it not only tastes fabulous, but also one of the most visually enticing of cheeses being made in Scotland today. The perfect accompaniment to freshly baked bread. Humphrey Errington’s Dunsyre Blue is a deep and soily cheese that will challenge all cheese lovers with its dark and flat undertones. Gorgeously creamy with a soft, long, blue mellowness, each flavour is distinct but perfectly poised, before a stunningly long aftertaste. Not one to be taken lightly, Dunsyre can be a versatile and rewarding cheese if eaten in the correct context. In some circles it is known that Dunsyre blends well with pears and ice cream. Anster (pronounced ‘Ain-Ster’) hails from the small fishing village of Anstruther in Fife, and is produced from unpasteurised cow’s milk within the converted cow shed at the St Andrews Cheese Company. The crumbly, light texture of the cheese opens up the depth of its fresh citrus flavors. The farm itself is located just north of Anstruther and not only can visitors buy the cheese direct from the farm, they can also see it being made and talk with the makers as they go about producing Scotland’s newest cheese. Made by Connage Dairy, based on an organic farm at Ardersier by the shores of the Moray Firth. Their herd of Holstein Friesian with Jersey crosses and Norwegian Reds graze on clover-rich grasses producing full, rich milk that in turn produces wonderful cheese. Clava brie is a mild and engaging cheese. With hidden depths of bitterness and coolness it can be best eaten either straight from a chilled fridge or left to ripen to bring out its funky, buttery taste and unique grassy flavor. One of Scotland’s oldest cheeses, and the natural accompaniment to a pre-ceildh whisky, crowdie is a half-fat curd cheese made by Connage Dairies. The traditional recipe produces a soft, creamy cheese with a mousse-like texture, a fresh zesty aroma and a slightly sour aftertaste. IJ Mellis Cheesemongers has six shops across Scotland. St Andrews branch of Edinburgh-based specialist cheesemonger selling fine farmhouse and artisan Scottish cheeses.